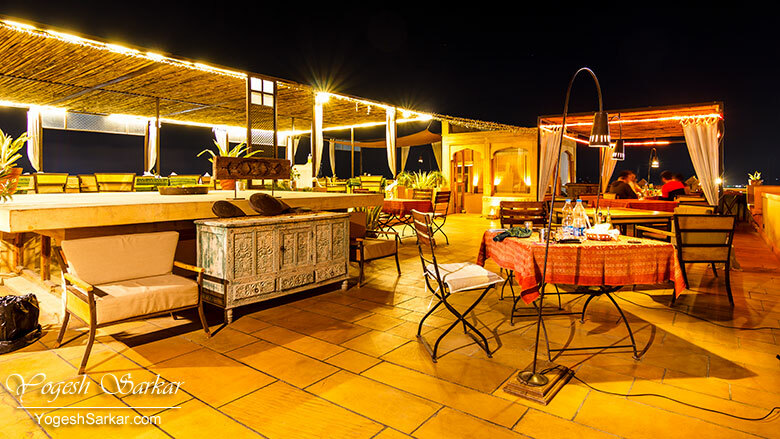 1st Gate Home Fusion, a restaurant I will forever remember for its beautiful view of the Jaisalmer Fort, serene ambiance and of course, good food. I guess these are tall words to start any review, but then again, anything short of it will do a terrible injustice to what I felt when I entered this restaurant and was presented with this view. After a 5 hour drive from Bikaner to Jaisalmer over mostly bad roads and diversions, we were exhausted and hungry. Having only had a bad breakfast and thereafter, a few snacks in the car. 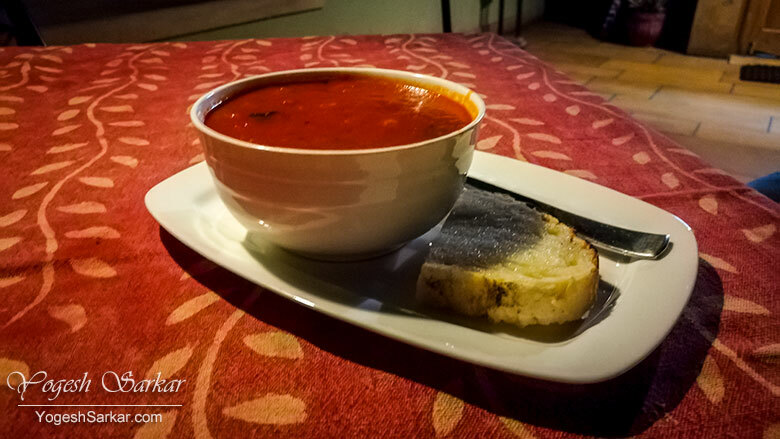 We were in a dire need of good food and a relaxed atmosphere. And since this was the only night we would be spending in Jaisalmer, we also needed a restaurant with a view. A view of the fort. While Mansi went online to look for recommendations, I opened up Lonely Planet India Travel Guide on Kindle and the first restaurant listed on it was the 1st Gate Home Fusion. Yet, it wasn’t the first place we went to. Instead, we first checked out a couple of restaurants Mansi had seen online and were disappointed by them. So we decided to look no further and headed for the 1st Gate, located near the Jaisalmer Fort’s 1st Gate. Even before we stepped out of the car, we knew we had come to the right place, since the view of the fort, even from the parking was stunning! 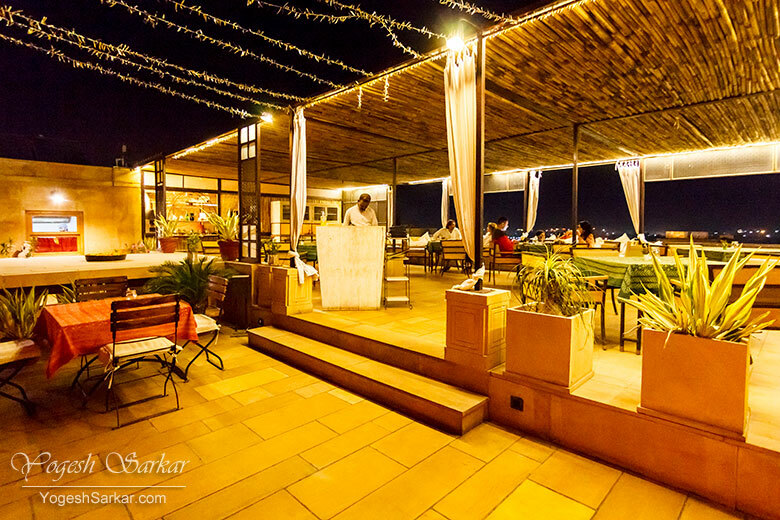 Though even if you discount the view of the fort, this rooftop restaurant is beautiful, to say the least. My sweet fresh lime soda was a little light on sweetness, though refreshing nonetheless and the soup Mansi had ordered was delicious! Even though I normally prefer white sauce, the pesto sauce won my heart and converted me into a pesto sauce fan forever. 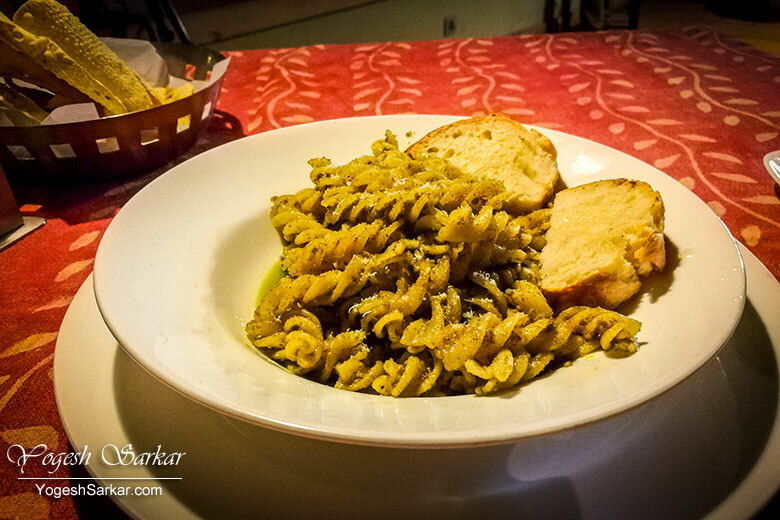 Hands down, this was the best pasta I have ever had. 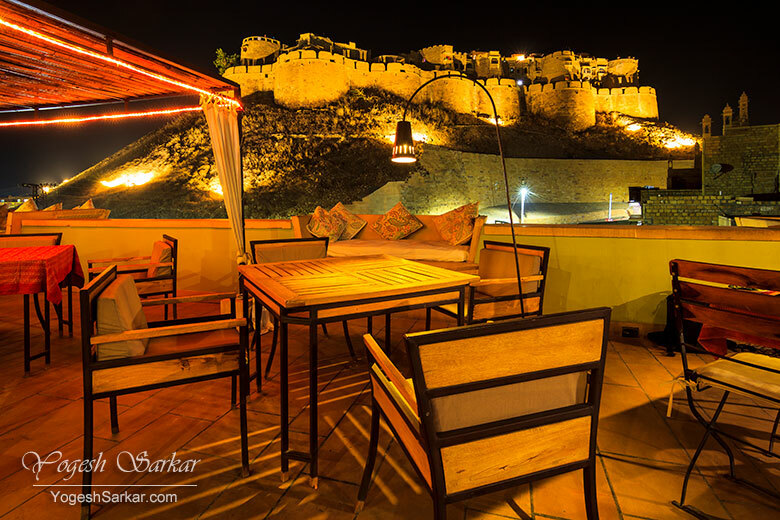 And with the view of the fort, light cold breeze, and serene ambiance, made for a perfect main course! However, greediness doesn’t always pay off. 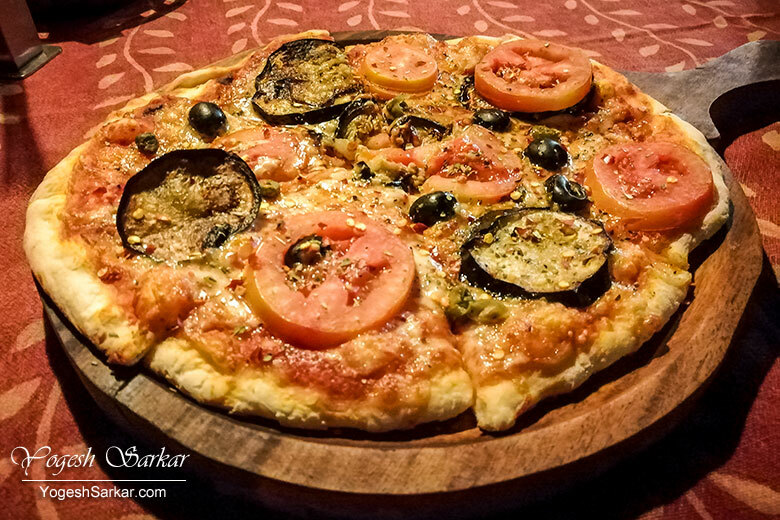 Even though the pizza was well cooked and delicious, large slices of eggplant and tomato robbed it of taste. If you remove those slices (which I did later on), the pizza was just about perfect! Service too was good for the most part, though a little slow at times. However, I can’t really complain. Because when we had ordered a bottle of water, the waiter had brought over a cold mineral water bottle, which we had opened. When Mansi found it to be quite cold and asked the waiter for another water bottle at room temperature, he brought another one over, yet charged us only for a single water bottle. Something we hadn’t expected, and we were expecting and willing to pay for the both. In any case, it was a nice touch and went on the make our evening even more wonderful. Our bill for Fresh Lime Soda, Pappa al Pomodoro Soup, Fusilli with Vegan Pesto, Siciliana Pizza and a bottle of water came out to be Rs. 1,271. Less than what we were expecting to pay for this experience and food. At the end of the day, 1st Gate Home Fusion is one of the best if not the best restaurants in Jaisalmer to have dinner at. They have a fabulous view of the fort, good service, delicious food and a beautiful and serene ambiance. Even beer and wine is available, though I guess for a setting like this, wine is more appropriate. The only downer for some might be the fact that they do not serve non-veg dishes. This is a pure vegetarian restaurant and even serves Jain sauce i.e. no garlic and onion based pizza. For me, 1st Gate Home Fusion was one of the high points of my Rajasthan trip and I cannot wait to go back there again to enjoy another beautiful and delicious dinner.